Gluten Free Chocolate Babka | Great gluten free recipes for every occasion. I wasn’t even planning to mention this, but I can’t stop thinking about it: Have you been wondering what’s in the new book, Gluten Free Classic Snacks (please say yes!)? As of yesterday, I’ve started reviewing the page proofs of the book (an electronic PDF copy of the book, with the final layout and photos!! ), and it’s simply gorgeous. This new book is packed with recipes and full color photos of every single possible packaged snack, cookie, cracker and candy you never thought you’d have again. The ones you thought you’d never, ever be able to share with your gluten free kid. Those. ALL of those. And I’ve secured permission to share the whole Table of Contents with you. I plan to tell you all about it on Monday here on the blog, and I can’t wait!! I think I’ll even sneak in a few of the photos from the book, so you can see for yourself what amazing recipes are coming your way next March/April! Is babka a New York thing? Kind of like black and white cookies and (apparently) rainbow cookies? 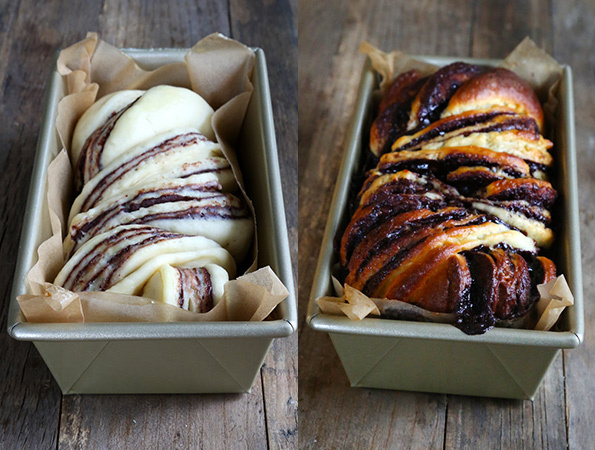 Babka is a sweet yeast bread (cake? ), and if you don’t know it from your local bakery, you at least must know it from Seinfeld, right? (say yes.) 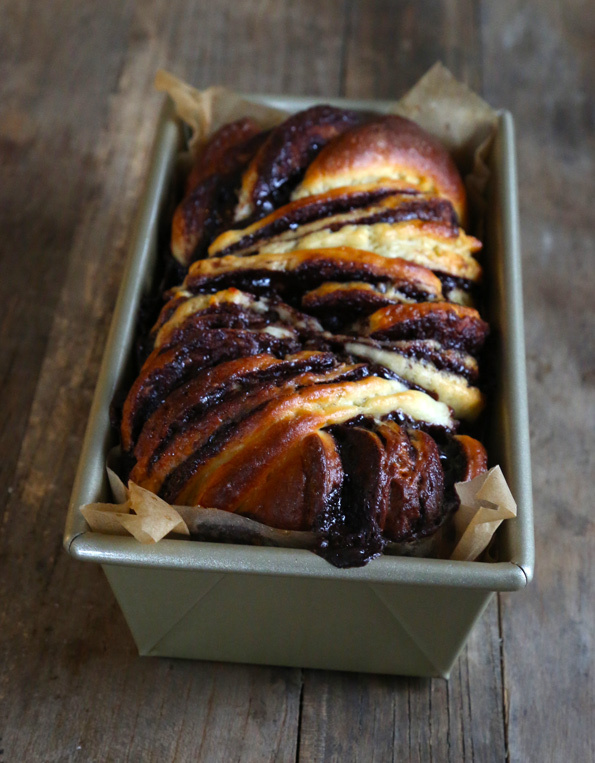 This gluten free chocolate babka is basically a version of our (already insanely gorgeous) braided Nutella bread, but swirled with a rich chocolate filling and baked in a loaf pan. It’s sweet and rich and decadent. Perfect for the holiday season! All that filling keeps the bread moist and tender for longer than you’d expect, too. Just imagine the oooohs and ahhhhhs you’d get if you brought this (along with at plateful of Christmas cookies) to that holiday party you’re looking forward to. You’d be a hero! Don’t let the number of step-by-steps fool you: this bread is actually incredibly simple to put together. The first rise of the dough is short, since it’s such a nice, enriched dough that’s already quite easy to handle. But if you’ve (finally!) been convinced that a refrigerator rise is the way to go, it won’t hurt the dough any to spend its first rise in the refrigerator for up to 24 hours (you don’t want it longer than that, really, since the yeast flavor will be too pronounced). Resist the urge to overfill the dough with more and more filling, by the way! I’ve been there, and the filling just leaks out of the dough and pools in the loaf pan. When you try to turn out the bread and slice it, it’s kind of a big mess. Less is more! If you really want more chocolate (and really who could blame you), why not serve the bread with extra chocolate sauce? ‘Tis the season to indulge! Make the bread dough. In the bowl of your stand mixer, place the flour, cream of tartar, instant yeast and sugar, and use a handheld whisk to combine well. Add the salt and whisk to combine well. Add the milk, eggs and butter, and mix on low speed with the dough hook until combined. Raise the mixer speed to medium and knead for about 5 minutes. The dough is a lovely, smooth, enriched dough. It climbs up the dough hook during kneading but remains intact and smooth. Spray a silicone spatula lightly with cooking oil spray, and scrape down the sides of the bowl. Transfer the dough to a lightly oiled bowl or proofing bucket large enough for the dough to rise to nearly double its size, spray the top of the dough with cooking oil spray, and cover with an oiled piece of plastic wrap (or the oiled top to your proofing bucket). Set the covered dough to rise in a warm, draft-free environment until nearly doubled in size (about 1 hour). Once it has risen, place it in the refrigerator for at least 15 minutes or until it is chilled. This will make it much easier to handle. Preparing the dough for shaping. Once the dough has risen and chilled, line a small rimmed baking sheet with unbleached parchment paper, and set it aside. Turn out the chilled dough onto a lightly floured surface and, using the scrape and fold kneading method and using a very light touch, sprinkle the dough with more flour and knead it lightly, sprinkling with flour when necessary to prevent it from sticking, scrape the dough off the floured surface with a floured bench scraper, then fold it over on itself. Repeat scraping and folding until the dough has become smoother. Do not overwork the dough or you will incorporate too much flour and it will not rise properly. Rolling out and filling the dough. On a lightly floured surface, roll out the dough into a rectangle about 1/4-inch thick, and 10-inches high x 12-inches wide, sprinkling very lightly with more bread flour as necessary to prevent sticking. As you work, shift and move the dough frequently, as shown in my pizza shaping video. Before the dough is fully shaped, transfer it to a piece of unbleached parchment paper. Spread the fudge sauce in an even layer on the dough, leaving a 3/4-inch border clean around the perimeter. Beginning at a 12-inch side of the dough, and using the parchment paper to assist you, roll the filled dough tightly into a cylinder, like a jelly roll, ending with the seam side down. Cover the dough loosely with plastic wrap, and place in the refrigerator to chill for about 10 minutes. This will make the final shaping easier. Final shaping and rise. Grease or line a standard loaf pan with unbleached parchment paper and set it aside. Once the dough has finished chilling, remove it from the refrigerator and uncover it. With a very sharp knife or pizza wheel, beginning about 1-inch from one end of the roll of dough, slice along the length of the dough all the way through to the end. You will have 2 strands of layered dough. Beginning at the intact end, twist each strand gently so that the cut sides of the dough are facing up. Braid the strands gently but securely back and forth over one another until you reach the end. You should have 4 twists before you reach the end. Cinch the open ends together and tuck them under the bread slightly. Place one hand on each end of the braid, and press the ends gently toward one another to create a slightly wider, shorter braid. Invert the braid onto a piece of parchment paper on top of a cutting board, then invert the prepared loaf pan over the top of the bread dough, covering the braided dough completely. Quickly re-invert the whole operation—from the loaf pan all the way down to the cutting board—and remove the cutting board and top parchment paper. Cover the dough with a piece of oiled plastic wrap, and place in warm, draft-free location to rise only until just beginning to swell (about 20 minutes, but it could be more if your rising environment is particularly cold and/or dry). Do not overproof. Bake. As the dough is in its final rise, preheat your oven to 375°F. Once the dough has finished rising, uncover it, brush the surface evenly with the egg wash, and place in the center of the preheated oven. Bake for 10 minutes, and turn the oven temperature down to 350°F. Continue to bake until the dough is golden brown all over and the bread seems mostly firm to the touch (about 25 minutes more). Remove from the oven, place the loaf pan on a wire rack and allow to cool for about 10 minutes before removing from the loaf pan, slicing and serving. Adapted from the recipe for Cinnamon Rolls on page 166 of Gluten-Free on a Shoestring Bakes Bread, as adapted into my Braided Gluten Free Nutella Bread recipe. P.S. Did you know you can pre-order Gluten Free Classic Snacks?! VERY EXCITING!! It sure looks decadent but definitely not like my Great Grandma’s Babka. Gotta try it !!! Wow! This is special. 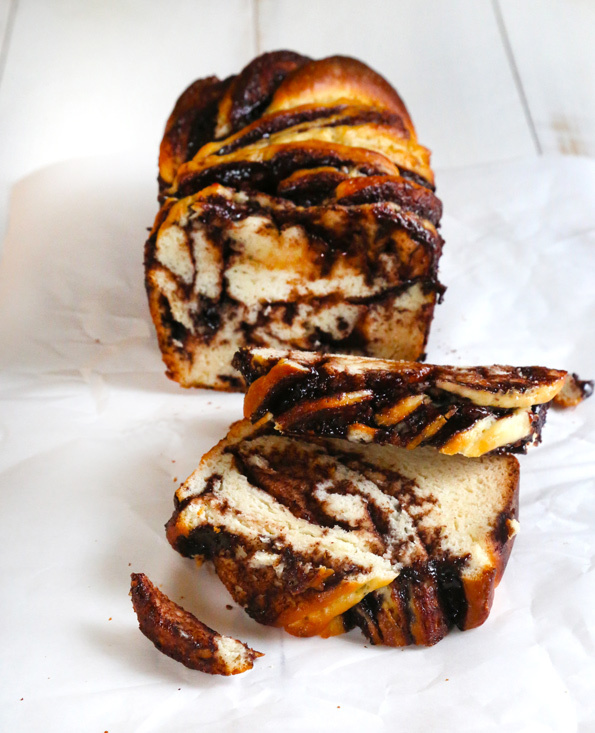 We have been pining for babka! Question: I need to bake dairy free. I have no problem substituting the milk and the butter but I’m not sure what to do about the whey protein isolate. Forget the family photos; put a picture of THAT on your Christmas cards! …And expect at least a 60% increase in holiday party invitations. Oh my! I will definitely be trying this! Cannot wait for that TOC on Monday! I’ve never heard of babka. Wasn’t a Seinfeld fan. This looks interesting. Have yet to try a braided bread. Hum. I made the nutella bread, and it was much easier than it looked like it would be. I have actually heard of this one and man does it look beautiful! AND YES YES YES I want to see the table of contents. can.not.wait. Absolutely beautiful! and yes I was wondering when your new cookbook comes out, can’t wait! I cannot handle how gorgeous this is, also that I’m not currently eating it.